The StarTrac Elite Crosstrainer is undoubtedly the best elliptical crosstrainer made by this company. StarTrac makes a variety of very well-designed fitness equipment in conjunction with BMW Design Groups, USA. The Select Fit design is unique in the industry. The Startrac Elite Crosstrainer was designed to offer some unique benefits for exercisers that no other elliptical crosstrainers currently have. To a great extent, this has been achieved, although it isn’t a machine that is flawless. 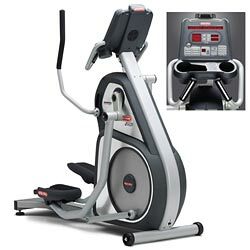 The variable upper body workout is the claim to fame of the StarTrac Elite crosstrainer and goes by the name, “Select Fit.” Instead of simply attaching the handlebars to the ellipticals to give an upper body workout in sync with leg movement, the Star Trac Elite has a completely separate system. For the upper body, the handlebars can be either pushed or pulled for a resistance workout that builds upper body strength while getting an effective lower body workout. With pulling, you work the back and biceps muscles while with pushing you work the chest and triceps. It’s an innovation that absolutely no other elliptical crosstrainer offers. The Star Trac Elite isn’t a well-known elliptical machine, but those who have discovered this crosstrainer love it. Trainers have found that the different forms of upper body workout, because they are independent of the lower body workout, are much more effective at true strengthening. They do caution that it can take a few tries to get used to, however. Trainers also feel that the option to use the stationary handlebars is nice for when you want to focus solely on the lower body. It gives you options that are truly “crosstrainer” worthy. Those who’ve purchased the StarTrac Elite Crosstrainer usually purchased it because of the unique Select Fit system. It combines strength and cardio in one machine at a price that doesn’t usually give you such an optimum workout. Once they start using it, they are pleased to find that the foot pedals, which are unusually large and well-cushioned, make workouts more comfortable than many other elliptical crosstrainers. With twenty resistance levels, a well thought-out console and the Select Fit upper body workout, we are really impressed with this elliptical crosstrainer. It offers so much for the price – we’re surprised that no one else has jumped on the bandwagon yet by offering the upper body resistance workout option. It makes so much sense, and the design on the StarTrac Elite is simply elegant in its simplicity. The only minor complaint we have is that the StarTrac Elite Crosstrainer is a bit noisier than other crosstrainers at this price point. You aren’t getting an elliptical trainer as quiet as, say, a Precor. On the other hand, you’re getting that cool upper body workout, and good stride length and plenty of variety in resistance levels, so why nitpick?